4. He must not be a "wicked" man; for the Law says (Ex. xxiii. 1): "put not thy hand with the wicked, to be an unrighteous witness." The Mishnah (Sanh. iii. 3) names as those incompetent the vicious rather than the wicked; dicers ( ), usurers, pigeon-fliers, and those who trade in the fruits of the Sabbatical year. A baraita in the Gemara on this section (ib. 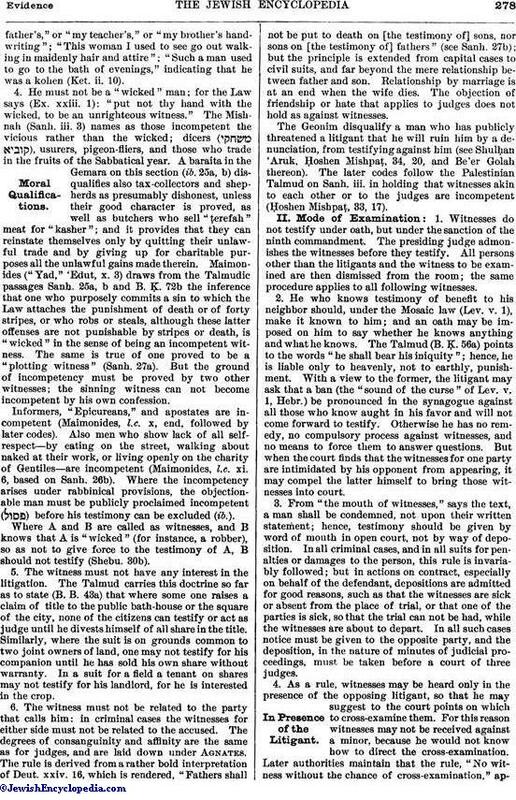 25a, b) disqualifies also tax-collectors and shepherds as presumably dishonest, unless their good character is proved, as well as butchers who sell "ṭerefah" meat for "kasher"; and it provides that they can reinstate themselves only by quitting their unlawful trade and by giving up for charitable purposes all the unlawful gains made therein. Maimonides ("Yad," 'Edut, x. 3) draws from the Talmudic passages Sanh. 25a, b and B. Ḳ. 72b the inference that one who purposely commits a sin to which the Law attaches the punishment of death or of forty stripes, or who robs or steals, although these latter offenses are not punishable by stripes or death, is "wicked" in the sense of being an incompetent witness. The same is true of one proved to be a "plotting witness" (Sanh. 27a). But the ground of incompetency must be proved by two other witnesses; the sinning witness can not become incompetent by his own confession.Informers, "Epicureans," and apostates are incompetent (Maimonides, l.c. x, end, followed by later codes). Also men who show lack of all self-respect—by eating on the street, walking about naked at their work, or living openly on the charity of Gentiles—are incompetent (Maimonides, l.c. xi. 6, based on Sanh. 26b). Where the incompetency arises under rabbinical provisions, the objectionable man must be publicly proclaimed incompetent ( ) before his testimony can be excluded (ib. ).Where A and B are called as witnesses, and B knows that A is "wicked" (for instance, a robber), so as not to give force to the testimony of A, B should not testify (Shebu. 30b). 5. In civil cases, other than those for personal injury, the court is not bound to go, on its own motion, through the formal cross-questions as to time and place (see Acquittal), with a view of finding a contradiction between the two witnesses, for such a course would "close the door before borrowers"; but where the judges have reason to suspect that the claim or defense is fraudulent ( ; ib. 15) they should take all proper means to break down the testimony on that side. This is often spoken of as , which is the general term for "evidence" or "proof." 2. A method to establish a deed, more especially a bond, at the instance of the holder, is given in the Talmud (B. Ḳ. 112a; see also B. B. 40a and Ket. 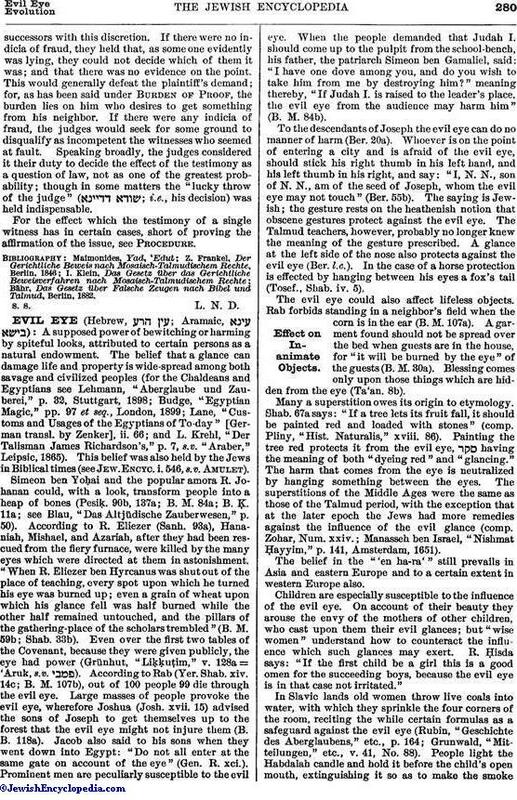 21a) and is recognized by the codes ("Yad," 'Edut, vi. ; Ḥoshen Mishpaṭ, 46, 3-4). 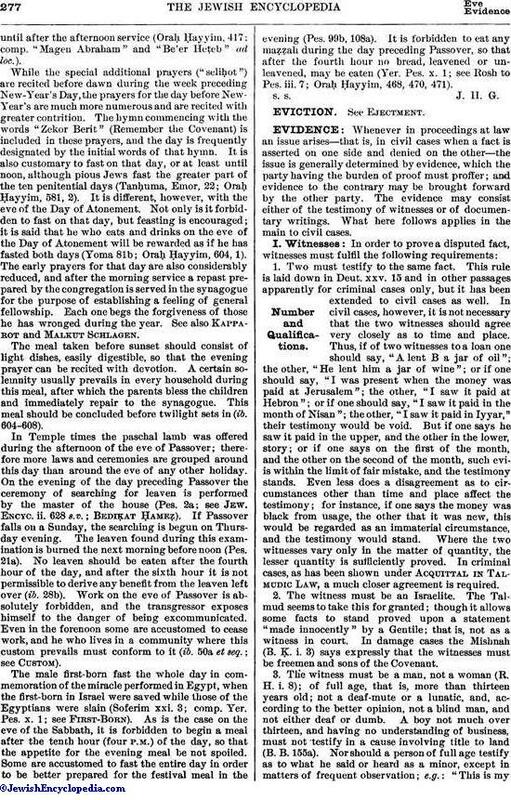 The two witnesses, at the instance of the holder, come before an improvised court, made up of any three respectable Israelites; and the latter write at the bottom of the deed "A B and C D appeared before us this day and testified to their own signatures, whereupon we have approved and established this deed"; and the three "judges" sign. Being in the nature of a judgment, this must be done in the daytime; but the proceeding is wholly ex parte. A deed thus established may, without further proof, be presented upon the trial of a case. The gloss of RaMA states that one expert is as good as three laymen, and that "in these countries" (meaning those of the German "minhag") it is customary for any rabbi at the head of a school ( ) to establish a deed. 4. It has been shown under Alibi how a "set" of witnesses may be convicted as "plotters" by another set or sets proving an alibi on them. But the opposite party may prove an alibi on the convicting set, or in some other way show that the facts testified to by the first set were impossible or untrue. Under such circumstances a modern judge or jury would weigh the credibility of the witnesses and the probability of their stories, and decide between them accordingly. The sages did not trust themselves or theirsuccessors with this discretion. If there were no indicia of fraud, they held that, as some one evidently was lying, they could not decide which of them it was; and that there was no evidence on the point. This would generally defeat the plaintiff's demand; for, as has been said under Burden of Proof, the burden lies on him who desires to get something from his neighbor. If there were any indicia of fraud, the judges would seek for some ground to disqualify as incompetent the witnesses who seemed at fault. 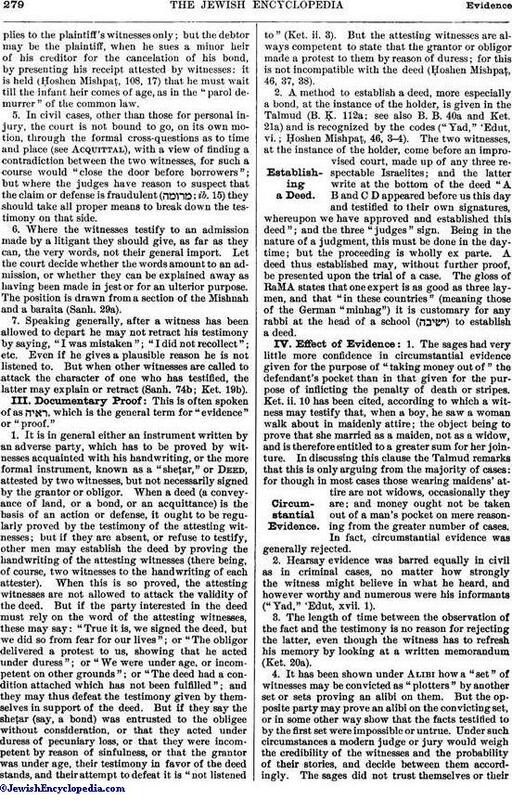 Speaking broadly, the judges considered it their duty to decide the effect of the testimony as a question of law, not as one of the greatest probability; though in some matters the "lucky throw of the judge" ( ; i.e., his decision) was held indispensable.For the effect which the testimony of a single witness has in certain cases, short of proving the affirmation of the issue, see Procedure.